Hey Everyone! We wanted to start the New Year with style, so we've brought you a new feature that we think will better help you to connect and communicate with others here on the forums. We've adopted what has become standard protocol on the large social networks -- @ mentions. Users can now mention their colleagues and those people who have already posted in a thread that you're responding to with the @ symbol. 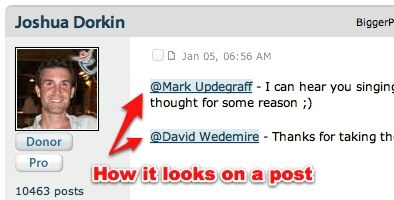 Simply type your forum post as you normally would, and when you want to mention someone, type @ followed by their name. Once you enter the first two characters of the person's name, it will appear below. Select the person by clicking on their name and you'll have created a mention. You'll know you did it correct when you see the name highlighted in blue. When you post your message, the person you mention will appear highlighted with the @ symbol in front and they will receive a notification on the site and in their inbox of the mention. Additionally, if you enter @? it will pull up all posters who previously posted on the thread to make things easier for you! I have a fairly simple (I think) question, as I am fairly new to posting here on BP. I posted something in the forums for a recommendation and a BP member told me to reach out to another BP member. I don't know how to reach out to that BP member directly, or am I supposed to just use the @their_name in the forum post that I created? Same here. No Android support. I love this function. Use it on my laptop/desktop all the time. Unfortunately, I can't use the @ function on my android. Not on the mobile site and not on the app. Is this a quirk of my phone? If it's simply not available, I'd request that it be added. Thanks! I can't get it to work, using Chrome on a PC, I am trying to mention someone in the thread, @? doesn't work either. This feature is great but I can't seem to get it to work on the app. Bummer. @Handel Carter & @Krystal Grubbs - Can you guys send a message to our support team at http://www.biggerpockets.com/contact with a little more information on what's happening? What app are you using - iOS or Android. Do note that you can only mention your colleagues or people who previously posted in a thread . . .
Can't get the @ and name to work. The @ and anything really. thanks for the post @? Yes, I tried both Chrome and Firefox just now to test the @ function, but it does not work with either browser. Hmmm. Too bad. 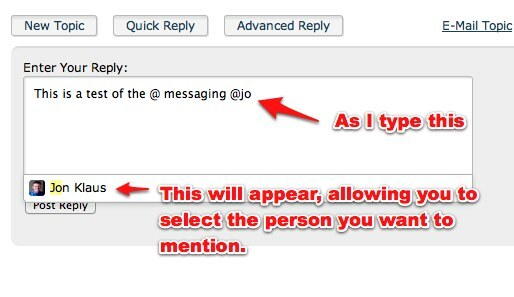 I think it could be a great feature, and it obviously works for some people because I see @ mentions all the time. Maybe I'll try Internet Explorer. . .
You can only mention colleagues or those people who previously posted in a thread. Perhaps that's the issue? The functionality is working fine at the moment. I'm using Chrome, and it's got some bugs. Sometimes it doesn't work at all and when I reload the page it works. Othertimes it works but inserts the text "undefined" into the body of my post immediately after the mention. When I type "@" and then start typing the name of the person, the menu below pops up allowing me to select the person for the mention, but I have to use my mouse to actually click the name. It would be nice if it worked like Facebook where you can use the Arrow Keys and Enter Key to select the person so you can keep your hands on the keyboard and not have to use the mouse for that. Same here with Chrome. The @ function works sporadically at best! You can only mention your colleagues or those people who previously posted in a forum thread. 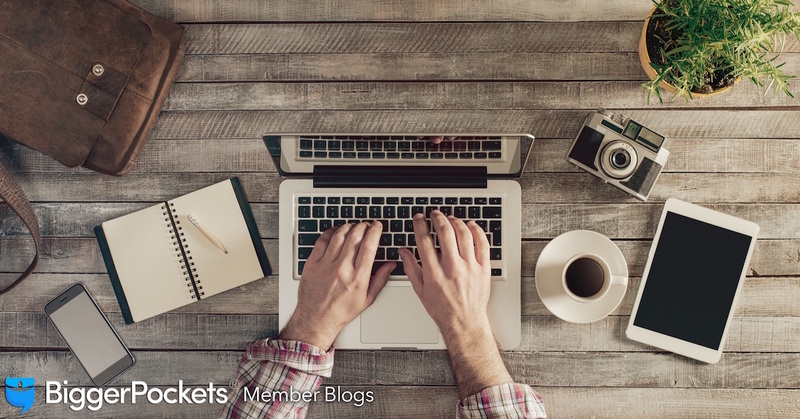 On the blog, you can mention the author. help I typed @names, no names pop up from the bottom? thanks Joshua Dorkin. just bumping this because i have been wondering how to @mention someone. didn't even know what to call it. I know that I have tried mentioning someone who has posted in a thread when I was using an Android phone. I did try the @? functionality as well. Thanks and will do. Is there a BP mobile app for Android? @Joshua Dorkin I am glad that I joined this community. We have an iOS app at <a href="http://www.biggerpockets.com/app">http://www.biggerpockets.com/app</a>. @Joshua Dorkin I love the community that you have built here and I look forward to becoming more involved. I think that the mention feature is great. I am hoping to figure out what I need to do differently in order to get it work for me. Do you have any suggestions as to why I am not seeing the mention function work in my posts? I tried mentioning someone that had already posted in the same thread but the mention function didn't seem to work.Thanks in advance for your assistance. Joshua, thanks for building such an awesome community! Hey Karen - How are you accessing the site What brower/version and operating system are you using? Have you tried our @? functionality (allows you to see everyone who posted in the thread already)? I tried to tag someone via mobile and it didn't work. Then I tried two different browsers (Firefox & Chrome) on a desktop and still no results. Am I missing something here? On mobile, you'd need to use our iOS app. Otherwise, you can only mention colleagues or people who previously posted in a thread. I hope that helps. Jay Hill - It is disabled on the iPad and iPhone through the website itself, but works using the BP Mobile App. @Joshua Dorkin Does it work on IPad? I just tried it here and didn't get your name below. I've had a few queries about the @Mentions system over the past few days, so I thought we'd revive this for all to see. There's a lot happening here, Shane Woods. Features like our @Mentions are great for keeping people in the mix. Thanks Josh, way to go!!! @Michael - You can shut all @ emails in the email settings. At present, there is no way to block an individual. The only people who can @mention you are those people you are colleagues with and those people who have posted in the same thread as you. @Ned - This is currently only implemented in the forums, but we'll soon be bringing it to the comment system around the rest of the site. I just went back an edited a forum comment to add it. I noticed in your comment above where you used @Dave, Jerry, and Charles it doesn't show as described. Does it not work for post comments? @Josh Thank you making feel a wee bit old. I had no clue what people were trying to accomplish when writing the @ symbol other than speaking directly to them. Will there be a way to block the @ emails from users or do they only come from people youve authorized to follow you? @Demond - No problem. Please consider uploading a personal pic so we can better get to know you. @Jon - Me too. @Bill - Thanks, and I appreciate the tweet! I've never used them before now, but like them. Thanks Josh! @Dave - Thanks. Glad to hear it. @Jerry - It will work for people who have already posted in the thread and with your colleagues. @Charles - Agreed! BTW - We'll soon be adding it to the comment system of the blogs and the rest of the site. Thanks Josh. I like it. A chance to give credit where credit is due. Will definitely use it.